Building 100,000 government-funded social rent homes a year over the past two decades would have cut billions from the housing benefit bill, provided higher disposable income for tenants and generated significant economic returns, new analysis from the LGA reveals. 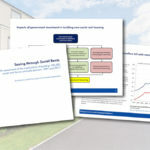 The Local Government Association said its new research — Savings through Social Rents — provides evidence for why the Government should use the Spending Review to work with councils to ensure that the genuine renaissance in council housebuilding needed to increase housing supply, boost affordability and reduce homelessness, is a success. Social rent, which provides secure tenancies on low rents for low-income families and vulnerable people, is at a historic low. In 1997, over a third of households lived in council housing, compared with just one in 10 today. The number of homes built for social rent each year has fallen from over 40,000 in 1997 to 6,000 in 2017. This decline has resulted from the policies of successive governments, such as rules and restrictions hampering the ability of councils to replace homes sold through Right to Buy and central government control of rental income and borrowing limits. This loss of social housing has led to more and more individuals and families finding themselves pushed into an often more expensive and less secure private rented sector. As a result, the housing benefit bill paid to private landlords has more than doubled since the early 2000s. Building 100,000 social rent homes each year for the past 20 years would have enabled all housing benefit claimants living in the private rented sector to move to social rent homes by 2016. The housing benefit claimants that would have moved from the private rented sector to social rent homes would have benefited to the tune of £1.8bn in extra disposable income over the period. Overall, the Government would have had to borrow an additional £152bn in 2017 prices to build the homes over the 20-year period. With every pound spent on building homes generating £2.84 in return, the cost of investing in social housing would have been offset by additional tax revenues generated by the construction industry as well as welfare savings from moving housing benefit claimants to lower cost social rent homes. The rising proportion of housing benefit caseloads in the private rented sector has cost an extra £7bn in real terms over the last decade. The Government recently accepted the LGA’s call to scrap the housing borrowing limits hampering the ability of councils to invest in new and existing homes, but additional flexibilities would lead to more homes being built. The LGA said if councils are to truly fulfil their historic role as major housebuilders then the Government needs to allow councils to keep 100% of Right to Buy receipts and set discounts locally to replace every home sold, as well as setting out sustainable long-term funding and a commitment to social housing in the Spending Review. Cllr Martin Tett, LGA Housing spokesman, said: “Every penny spent on building new social housing is an investment that has the potential to bring significant economic and social returns. “Now is the time to reverse the decline in council housing over the past few decades. This is the only way to help families struggling to meet housing costs, provide homes to rent and reduce homelessness while also providing economic growth and lowering the housing benefit bill. “The last time this country built homes at the scale that we need now was in the 1970s when councils built more than 40G% of them. With millions of people on social housing waiting lists, councils want to get on with the job of building the new homes that people in their areas desperately need.